6 Weeks with Daz Studio is a weekly account of my personal adventures with this interesting and powerful 3D program. I’ll share my observations, projects, and ideas about the program along with any tutorials, websites and artists I come across. Be sure to visit Renderosity’s Daz Studio Pro forum and, of course, the Daz 3D website where you can download the program free of charge for Mac and PC. Last week (week 4) I dove into Iray render settings after doing online research. I discovered that these settings are incredibly deep and complex. Now you can either purchase a pre-made render set-up or just try out settings proposed by Daz and Renderosity members. I chose the latter and while I still have a lot to learn, I was able to improve my portrait render. The one area I wasn’t able to improve was the skin, however. I suspect I’ll need to buy a new skin shader to achieve the realistic look I’m after. Since I only have two more weeks with Daz Studio, I’m going to create my own project from scratch. After a month working with the program, I feel I know it well enough to do this. For no particular reason other than the fact that I’ve recently been looking at a series of old crime scene photos, I’m going to create my own version of a murder scene. The photos came from a Vice Magazine article on a New York photo gallery called Murder in the City, New York, 1910–1920. Since the scenes are graphic depictions of murder, I won’t post any here. Follow the link if you want to see them. I wanted to avoid purchasing anything for this first project, so I began by looking in the Free Stuff section at Renderosity for the location of the murder scene. 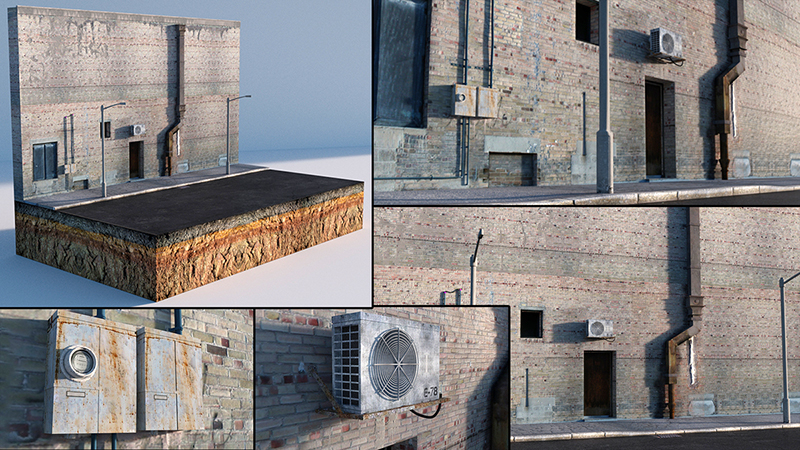 I found an excellent 3D scene: Street Scene Block_01 by woodkz71. Renderosityy always has great free stuff because the artists there like to share. woodkz71 made the set available in the .obj format with materials for the set in an .mtl file. I thought it would be simple to import the obj into Daz with the materials as long as I had both files in the same folder. But it was more complicated than I anticipated. At one point I imported the .obj set file into Blender and was going to apply the materials there and then export as a collada file which Daz Studio would import with textures, but I gave up. My problem was I could import the set as an .obj, but I had trouble with the scale and applying materials. The set would import with solid black materials which made it very difficult to see while setting up my homicide victim pose. Eventually, I was able to apply materials through the Surfaces tab, but they were black and white. Despite research, I simply couldn’t figure out how to apply the materials so that they appeared in color. So I gave up. Then I realized that the picture that inspired me was not a full-color picture. That means I can render my scene in black & white and then post-process in Adobe Photoshop. Perfect! I decided to use a G3 figure for the scene simply because he had the clothing, poses, and hair that I needed. I have to say, however, that the overall clothing choices for the default Daz Studio content did not have much variety. So I imported my G3 character into the Street Scene set and immediately realized that the scale was way off (huge character, tiny set). So I deleted the set and re-imported using another scale (Blender this time) which worked as both the character and the set were the right scale now. Daz Studio excels at posing 3D characters. You have so many different ways to pose so I just explored over an hour or so until I came up with the look I wanted. I used a combination of tools available in the Posing tab and also the posing tool which you access via the top of the Daz Studio interface. The posing tool allows you to drill down to the bone level. 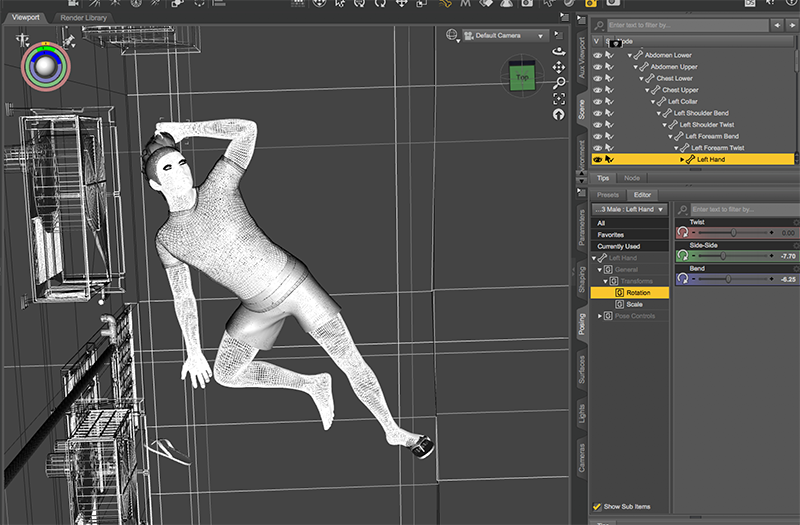 I really enjoyed this part of the process and after 10 minutes I was quite comfortable posing my character. Here’s my final version of the murder scene before I take it to photoshop for blood and other adjustments with brushes. Of course, the clothing isn’t right and I need to polish the pose a bit, but it pleases me. A quick side note: I started this project on my PC but it became difficult to do the fine posing work for some reason. I switched to my 2018 Macbook Pro which, despite slower rendering, proved to be much more responsive for posing. Not sure why that is, but I’ll think about it for next week.